Black Kenneth Cole Bags first surfaced on Chictopia's streetstyle gallery in Winter 2010 seen on Manila blogger inKARLcerating of inkarlcerating.com. 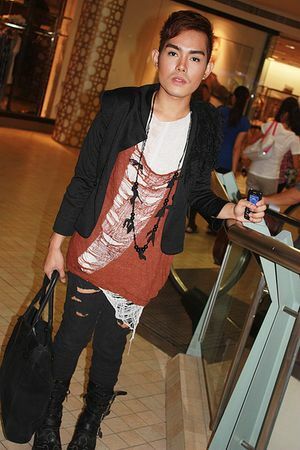 He wore his black Kenneth Cole bag with a red ADD shirt, white Hanes shirt, and black Terranova pants. Since then, Black Kenneth Cole Bags have grown in popularity as bloggers from Manila, Raleigh, and Cebu have discovered them. Black Kenneth Cole Bags are generally seen in casual, comfortable, and classic style. Popular types of Black Kenneth Cole Bags are sling bag, backpack, leather bag, leopard print, and tote. There are currently 34 streetstyle photos of bloggers wearing Black Kenneth Cole Bags. 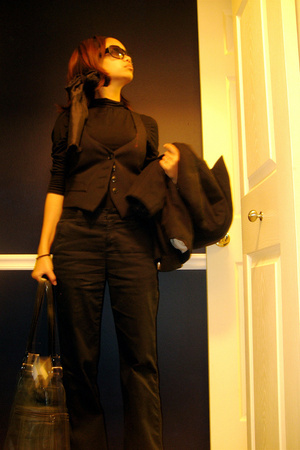 Most recently, blogger inKARLcerating of inkarlcerating.com styled his black Kenneth Cole bag with a black DREX FABLE cardigan, Terranova pants, and white osaka shirt.